gunrunners and a host of other participants getting crossing Sticky’s path. He leaves Belfast briefly to follow trails in Hamburg and San Francisco, in search of clues to solve the crime and enhances his cultural soul in the process. Contemplative, nostalgic and sincere when it suits him, but also quick with a one-liner and a punch, Sticky perseveres through loves and losses, casualties and stumbling blocks, personal challenges and threats, and discovers that his beloved poet was murdered because of a grudge from years before over an arms deal. Sticky realises that this is no ordinary confrontation, certainly not one for normal justice, so he sets up the rival parties and lets them shoot it out between them in the docklands of Belfast. I am convinced I have the storyteller's gene in me because of my Belfast upbringing, a sense of humour, a sense of the ridiculous, a sense of reality and a sense of justice. I have bulging files of poetry, song lyrics, fiction and non-fiction ideas to keep me company when my mind goes blank. 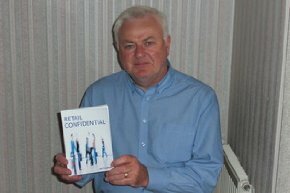 I have several strings to my bow including a long career in retail management, hence my book Retail Confidential. I write fortnightly radio reviews for Tribune magazine, and the occasional book, TV, and theatre review, telling it like it is but mostly with a light touch. I have contributed to a BBC NI documentary, (as film expert): "Stephen Boyd: The Man Who Never Was" (Boyd starred in "Ben Hur", etc) and appeared on several radio programmes talking about business, poetry and general stuff. I am always on the lookout for interesting projects to write myself, to ghost write on behalf of others or to collaborate in joint authorship arrangements.